Walking onto a commercial jobsite you might find 50 or more extension cords being used throughout the site with many of them looking the same as the others. At the end of the day, when these cords are covered in a layer of dust, it can be tricky figuring out which cords are yours. 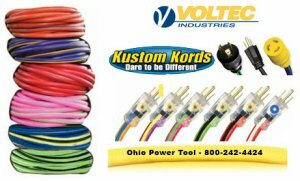 One solution is to show up to the job with a completely unique cord that has been customized to your specifications.